I can’t believe I’m typing this out, since this seems like a 2007-inspired feature (that may have once existed in 2012), but you know what would be cool? 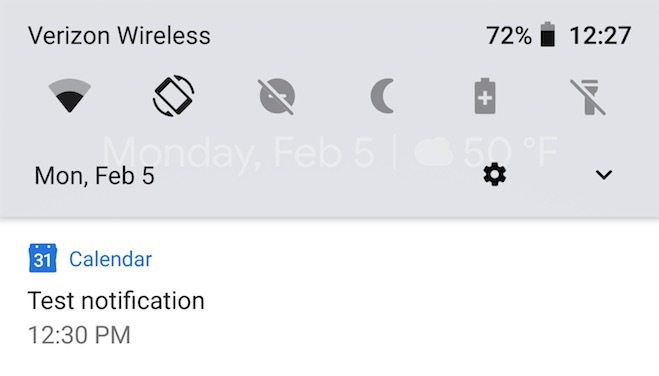 A snooze button in Google Calendar notifications on Android. You know what I mean, right? 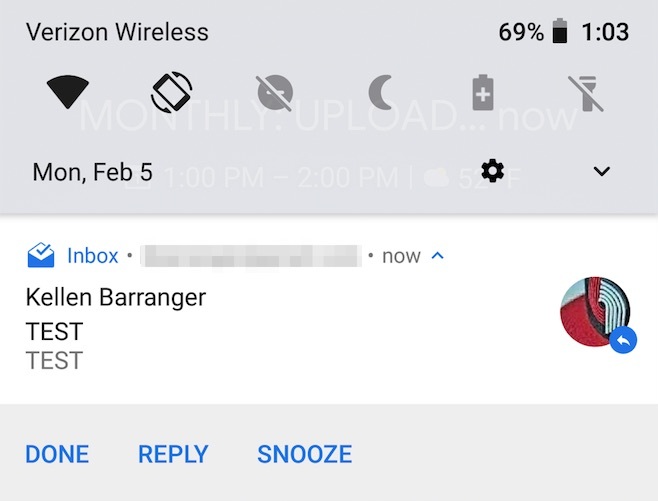 As a Google Calendar event or reminder pops up on your phone, you could tell it to snooze for 5 minutes or for 10 minutes or at the event start time. Google Calendar on Android really doesn’t do this anymore. The notifications from Google Calendar have no actions. Zero. The only action you’ll see is from a reminder, and that only lets you say, “Done.” Think about how ridiculous this is. On my desktop, I use Fantastical as a stand-alone calendar app. When it notifies me of anything, I get a notification that either lets me close the reminder/event or snooze it for as long of a period of time as is needed. And then in 5 minutes or 30 or an hour, it pops back up. Because that’s how this whole calendar thing should work. It is a time management application, after all, so there should be more controls over how it works on Android, starting with the ability to snooze. Now, I’m fully aware that with Android 8.0+, I can do this awkward mini-swipe of notifications and have them snooze for 15 mins, 30 mins, an hour, or 2 hours. Something about that actually doesn’t feel all that natural, as if it’s not a part of the app (which it isn’t) or could be unreliable. I want a button that looks like it was purposely put into Google Calendar that gives me options to snooze calendar events as they pop up. For example, Inbox has a snooze button for both emails and reminders. Google Assistant lets you do it with reminders too. Those aren’t calendar apps, yet they do something that Google’s own Calendar app should have done forever. I’m also aware that apps like Calendar Snooze could probably offer up a solution for me too. I could even install a 3rd party calendar app and just not use Google Calendar. Do I want to install a 3rd party app just to get a basic feature that Google once had and seems unwilling to add back? No, not really, but I guess, maybe I’ll have to? I just feel like the stock Calendar app that comes installed on most phones should do something as standard as snooze notifications.